In 2018, Papa John's was the fourth-largest pizza chain in the U.S. With over 5,000 units worldwide and relatively low start-up costs, the desirability of having a franchise becomes easy to see. John Schnatter, the Founder, largest shareholder, and recent board chairman, was voted off the Papa John's Board of Directors in July 2018 for use of a racial slur during a training call. Despite this news, franchise information hasn't changed, and neither has its standing as an investment opportunity. The company makes it easy to get started with a franchise. As of mid-2018, the initial investment is low for a franchise, and with significant backing from the company itself, a franchise seems an investment worth considering. International milestones include landmark 100th store openings in the U.K. and China in 2008, plus the franchise's very first store opening in Amman, Jordan. Papa John's is taking full advantage of its website, as it was the first pizza chain in the world to offer online ordering, and can scale into foreign markets with considerable ease. Papa John's offers a surplus of support to help franchisees become successful. These resources include a team of franchise business directors, regional marketing directors, and operations specialists that analyze all facets of your franchise business from the inside out. This includes site selection assistance, IT systems, risk (insurance) services, and quality management. 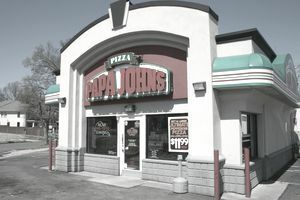 Papa John's also offers its exclusive PJ Food Service as the franchisee's one-stop shop for nearly all the ingredients and supplies that franchisees will ever need, including paper items and cleaning supplies. Access to this service is one of the reasons the franchises are so profitable since the generalized supply chain keeps costs extremely low. How Much Does a Papa John’s Franchise Cost? Papa John's will tell you up-front that you can have as many units as you want, so long as you have the net worth to purchase and support them. Minimum net worth for one unit is $250,000. Four to 10 units are $1 million, and 11-plus units require $2 million in net worth and are generally purchased by a group of like-minded investors. Liquid assets consisting of cash or readily available financing (or both) should total at least $250,000 for any number of units; they don't scale. Other qualifiers include at least one partner, a successful business management background, and close proximity to the location chosen. The franchise fee is low at $25,000, with an ongoing standard royalty fee of 5 percent of net sales that is payable monthly. You must devote at least 8 percent of your monthly sales to advertising and marketing. The estimated investment is about $300,000 for an average unit of 1,200 to 1,400 square feet located in a strip center. This can vary considerably, but the majority of franchises are built upon this model, so it serves well as a baseline. Papa John's Pizza is relatively simple to get into compared to other restaurant franchises. The net worth requirement is reasonable, and the royalty is a standard 5 percent that's renewable every 10 years. Absentee ownership is doable, and Papa John's actually encourages that you not have quick-service restaurant (QSR) experience. However, the company does offer a six-eight week initial managerial and profit-enhancing training program in exchange for that franchise fee. The experience can be particularly valuable whether you want to be a hands-on owner or stand in the wings. Ongoing training is available for both you and your team. Papa John's was named the No. 1 pizza chain brand by Harris Poll EquiTrend in 2017, and No. 1 in customer satisfaction by the American Customer Satisfaction Index. About the only real con, the obligatory marketing budget takes a measure of control and flexibility out of an owner's hands. It fails to take into consideration that you might be able to hire a talented marketing firm at a lower price. This aspect is sure to factor into the brand's low franchise percentage fee since many star marketing directors could be hired for a lower price than the Papa John's marketing fee. The low upfront cost, net worth requirements, and fees associated make a Papa John's franchise seem like a worthwhile investment for the affluent investor. There are factors outside of the brand, such as location and competition, that will affect a franchise's bottom-line, but it is hard to find another franchise that boasts both this type of brand power at such an affordable startup price.